2 Dedicated SFP+Fiber uplinks/stacking ports Dedicated SFP+ ports provides fiber uplinks without sacrificing any downlink Gigabit port. 2 SFP+ ports provide not only redundant uplinks, but can also build dualredundancy by a trunked uplink with link aggregation and failoverredundancy. Note that stacking requires the use of SFP+ (10G) modules only. 2 Dedicated 10GBASE-T uplink/stacking ports Dedicated 10GBASE-T ports supporting 10G/1G/100M speeds can be used for redundant uplinks, or for stacking at 10G speeds only. PoE+ Support on all ports (PoE models) Flexible to plug-in or change into high-power PD devices on any port without worrying which one port to plug in and whether it will be running out of PoE+ ports. One USB port on the rear of chassis Quickly and conveniently upgrade or restore firmware. Energy Efficient Ethernet (IEEE 802.3az) Maximum power reduction for onging operational cost savings. Stacking with up to 6 switches and 40G bi-directional bandwidth Improved network reliability and resiliency. Easy management and great Solution for virtualized environments. Dynamic VLAN assignment Build current network with future in mind. Ensure investment protection and a smooth migration to an IPv6-based network without switch replacement. Static routing A simple way to provide segmentation of the network with internal routing through the switch – reserving the router for external traffic routing only, making the entire network more efficient. Comprehensive IPv6 support for management, ACL and QoS Build a secured, converged network with all types of traffic by preventing external attacks and blocking malware while allowing secure access for authorized users. IGMP snooping and MLD snooping Advanced controls for optimized network performance and better delivery of mission-critical traffic such as voice and video. Robust security features Automatic Voice over IP prioritization (Auto-VoIP) simplifies most complex multi-vendor IP telephone deployments either based on protocols (SIP, H.323 and SCCP) or on OUI bytes (default database and user-based OUIs) in the phone source MAC address, providing the best class of service to VoIP streams (both data and signaling) over other ordinary traffic by classifying traffic, and enabling correct egress queue configuration. Similarly, Auto-Video VLAN enables IGMP snooping to minimize broadcast streams. Comprehensive QoS features Ensure no exchange of unicast, broadcast, or multicast traffic between the protected ports on the switch, thereby improving the security of your converged network. This allows your sensitive phone phone conversations to stay private and your surveillance video clips can be forwarded to their designated storage device without leakage or alteration. Dual firmware Images and configuration files IP phones and PCs can authenticate on the same port but under different VLAN assignment policies. Users are free to move around and enjoy the same level of network access regardless of their physical location on the network. Protected ports Private VLANs help reduce broadcast with added security. Dynamic ARP inspection Dual firmware images and dual configuration files for transparent firmware updates/configuration changes with minimum service interruption. Multicast VLAN registration Dual firmware images and dual configuration files for transparent firmware updates/configuration changes with minimum service interruption. EAV (Ethernet Audio/Video Bridging) support1 Dual firmware images and dual configuration files for transparent firmware updates/configuration changes with minimum service interruption. 1 EAV support can be acquired through the purchase of EAV software license that is sold separately from the switch. Please refer to ordering information for part numbers of these licenses. This product is backed by a NETGEAR ProSAFE® Lifetime Hardware Warranty. ** The NETGEAR OnCall 24x7 contract provides unlimited phone and email technical support for your networking product. For ProSAFE products purchased prior to 06/2014, also includes nextbusiness-day hardware replacement. 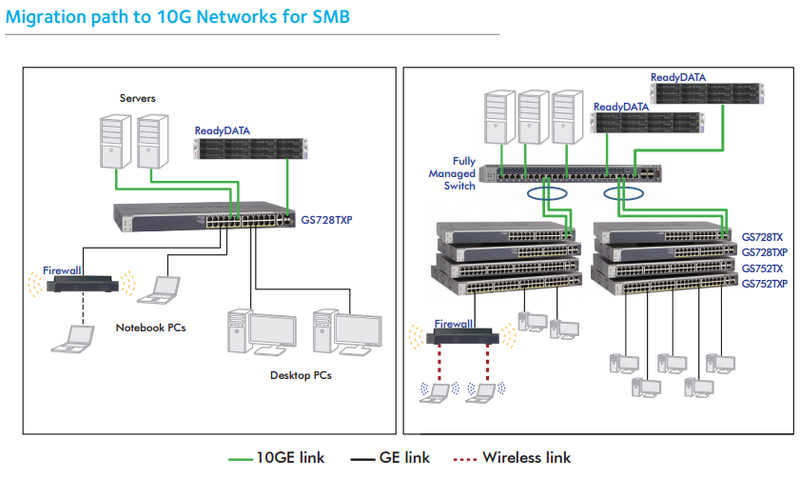 Why the NETGEAR latest generation of Gigabit Stackable Smart Managed Switch with 10G links is the right choice for SMBs? Lifetime warranty on hardware, lifetime next-business-day (NBD) replacement, lifetime tech support online chat, and 1-year Free Advanced Tech Support* for peace-of-mind. Download the NETGEAR S3300 Smart Managed Switch Series Datasheet (PDF).